Don't miss out on the March casino promotions including: Party Casino Mad Hatter’s Clickcard, reload bonuses and a $1,000 giveaway. Opt-in and login daily to claim your Clickcard prize which could be: casino bonuses, free spins or instant cash. Players can also make a first deposit to claim tickets to the March $1,000 cash giveaway. 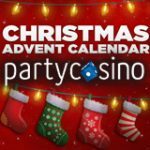 Players that have already deposited can take advantage of the Party Casino reload bonus for March 2017. Signup and opt-in for the Party Casino Mad Hatter’s Clickcard promotion and get a guaranteed free prize daily until 22nd, March 2017. 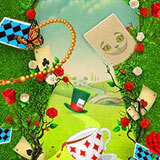 You daily Clickcard prize could be one of the following: Cash, Free Spins or bonuses. Get an exclusive deposit bonus for players from selected countries, get up to 80 free spins with your first deposit. 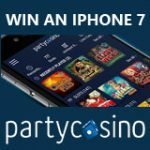 PartyCasino UK signup - 100% bonus up to £100 plus 80 Free Spins. 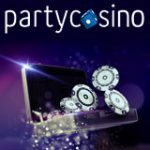 Party Casino Germany - 100% bonus up to €100 plus 80 Free Spins. Party Casino Europe - 100% bonus up to €100 plus 80 Free Spins. 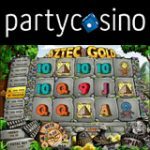 Party Casino Australia - 100% bonus up to $100 plus 80 Free Spins. 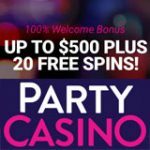 PartyCasino Canada - 100% bonus up to $100 plus 50 Free Spins. Make your first deposit of at least $20 to get your tickets to the $1,000 prize draw this March 2017. Players will get five tickets into the draw for every $20 deposited up to a maximum of $100. If you deposit $100 you'll get twenty-five tickets entered into the draw on top of your welcome bonus. Any additional deposits made in March will get you an extra two tickets for every $20 deposited. The prize draw will take place on 1st April 2017, one lucky winner will receive a $1,000 in cash with three days of the prize draw. 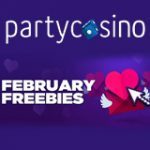 If you have already deposited you'll be eligible for an additional bonus, simply login to your account to reveal your Party Casino reload bonus code March 2017. Your bonus will be available for the entire month of March in the bonus section of your account. The bonus will be awarded instant after making a successful deposit of at least $30. Earn the required amount of points to clear your reload bonus, players have three days to complete their bonus before it expires.